Money Morning Capital Wave Strategist Shah Gilani, a retired hedge-fund manager who runs the Capital Wave Forecast and Short Side Fortunes advisory services here at Money Map Press, often makes counter-intuitive picks – like when he first recommended Microsoft Corp. (Nasdaq: MSFT) stock last summer. Since then, Microsoft stock is up about 16% and trading at about $40 a share. But Gilani believes MSFT is doing a lot of things right and is destined to go much higher from here. Recently, Money Morning Executive Editor William Patalon III caught up with Gilani to get an update on why he thinks Microsoft is still among tech stocks to buy now. Here's a partial transcript of that discussion. William Patalon III (Q): Three of the tech companies that you've recommended – Microsoft, Apple Inc. (Nasdaq: AAPL), and Facebook Inc. (NYSE: FB) – have made some interesting and important strategic moves of late. In each case, you said that you anticipated additional major announcements – in fact, those would serve as the catalysts to push the share prices higher. And you were correct. While it hasn't been that long since you recced Facebook, Apple and Microsoft have delivered some very nice gains. Shah Gilani (A): …Microsoft, of course, because it's like a team of seven-foot seniors taking on the corner playground kids. Patalon (Q): Well, you recommended Microsoft stock back on July 10. In fact, you recommended both Microsoft and Apple, declaring that they were both cash-rich tech giants that had fallen on tough times… but that each also faced increasing pressure to get their share prices moving again. And they were both incredibly timely calls. Gilani (A): They were… and for just the reasons I said. Gilani (A): …came out and announced a pretty sweeping reorganization. Patalon (Q): Right. And then, not long after, longtime CEO Steven Ballmer said he would retire. 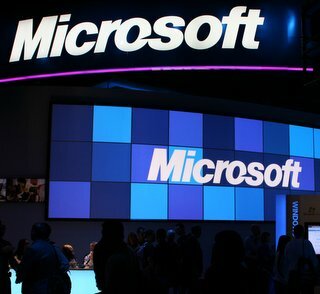 Right around Labor Day, Microsoft said it was buying the Nokia Inc. handset unit. And more recently the company has stirred interest by appointing Satya Nadella as its new CEO, and by introducing a version of Office for iPads and iPhones. So far, you've given folks a 16% gain in the stock. But I want to know what you see going forward. Gilani (A): Great. Let me start by saying that we own Microsoft stock because I believe it's going north of $100 a share in the next five years.